You have to give the folks over at the Willamette Week credit. After many years of poo-pooing their beer coverage, they're getting serious again. Their 2013 Beer Guide, released last week, is a solid piece of evidence along those lines. The Guide contains some nicely written content and photos from the local beer scene. Lots of knowledgeable, talented people contributed. They're billing this thing as their first Beer Guide in over a decade...which I suppose sounds better than saying it's the first in nearly 20 years. Because 1994 is when the last one appeared. More on that shortly. The reality is, WW was once a great source of beer information. They published a weekly column on beer, written for several (if not many) years by William Abernathy. Later, Jeff Alworth, whose Beervana is perhaps the oldest Portland beer blog, took over the beer writing post. But the column was splitting time with wine during most (maybe all) of his run there and was headed downhill. Not to get into a deep discussion of the 2013 Beer Guide, but it's worth picking up if you haven't already. I suspect copies can be found in pubs around town. A lot of people have quibbled about the Top 10 list, but such lists always attract attention for what is and isn't included. Nature of the beast, if you will. Pick up a copy and see for yourself. 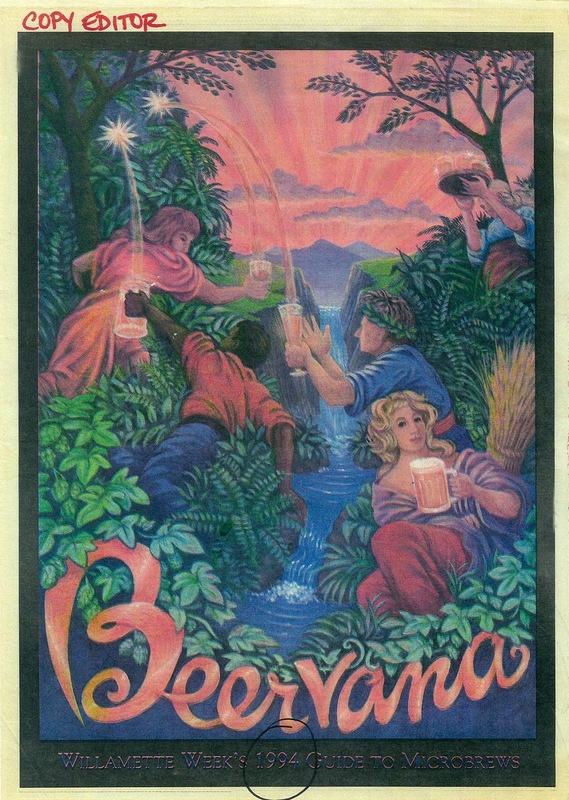 Perhaps just as important as the recent Beer Guide is that WW has made available the original 1994 Beervana insert on their website. You can download the PDF and discover what the beer culture was like in those days. We've come light years. I remember reading the insert from cover to cover several times back in the day. I always intended to keep it, but I suppose a dog must have eaten my copy at some point. So I had to look at it on microfilm last summer as part of book research. Not very handy. Now I've got a PDF on the computer. Very handy. Beyond the interesting, funny stuff in the 1994 piece, it is apparently also where the descriptor "Beervana" came from. Read Martin Cizmar's explanation here for more details. I can't vouch for the accuracy of this claim because I wasn't there. But it sounds right...and we did start calling this crazy place Beervana in the mid-90s. The 1994 Guide appeared at a good time. The craft beer movement in Portland was more than 10 years old and it seemed stable and here to stay. It's entertaining and quaint to see what was happening and what the writers were thinking. The old ads are fun, too. I recommend downloading this piece of Beervana history. It's not like you have to pay for it.